January 2005 I began noticing my above ground pool needing some significant attention. This was not surprising after 12 years of trouble free usage from June to September each year. I had always wanted an in-ground pool so rather than repair or replace the above-ground I began communicating/exploring this in-ground option with Wade of Clearwater pools. We spent the month of February and early March communicating and working the option of this in-ground,–size, pool options, etc. to meet the budget I had available. One thing Wade told me throughout early March 05 was that if I wanted to be swimming in early June, he and his very experienced crew would need to begin late April/early May. 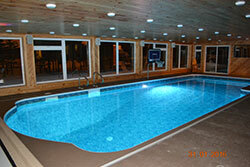 We agreed on pool options/size/price and the start time by the end of March 05 and Wade began, on schedule, late April. 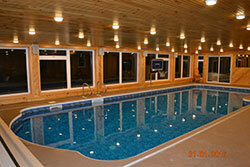 The in-ground pool was completed by mid-May (the only delay was due to a small snow storm). Wade is very experienced in building the above and below ground pools in Newfoundland.. During the construction of my pool after the initial excavation Wade ran into significant ground water and by the end of that same day he had a fix in place to allow the water to be managed and to allow the completion of the pool’s concrete floor, on schedule, in the coming days… In Newfoundland you will seldom deal only with sand; rocks/underground cliff/ground water/etc, are to be expected. Wade’s experience allows the systematic resolution of these potential issues. If Wade agrees with you on completion timing and price you can sleep well being assured that he will meet his commitment. I have used Clearwater ( Wade and his family) to commission my pool in the spring, usually around end of May to beat the rush on his time in June, and de-commission in October, to ensure correct winterization of this significant investment. Proper winterization ensures trouble free start-up in the spring. This is a family business and Wade’s wife and two sons are very active in accommodating the needs of their ever growing customer list. The list is growing, I am sure, due to their commitment to schedule and their personal attention to their customers. One final important item when considering the installation of an in-ground; look at the step in section, it is added cost but in the long run it is very functional, great for seniors and small kids that will be getting in and out of your pool. 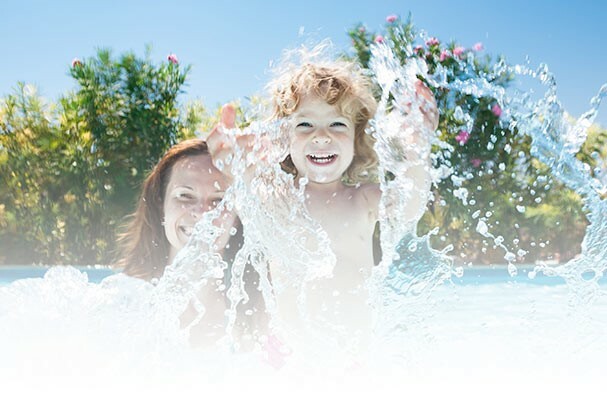 I highly recommend this family business and would be only too glad to share other aspects of my experience as you contemplate the installation of a swimming pool from Clearwater Pools. It is a pleasure to have the opportunity to express our appreciation for the excellent workmanship that was exercised in the construction of our swimming pool. When we were ready to find a contractor to do the work, you were the first we contacted. A couple of so-called experienced swimming pool contractors could not even be bothered to return our calls let alone give us estimates, but you were different. You discussed the project with us on a friendly, comfortable and professional basis. Your personal enthusiasm was matched by your consistent and positive alterations that persisted during the course of the project. You were not afraid to make the necessary changes to achieve the right results. The job started on time and proceeded quickly. Obviously, a lot of time, effort and expertise went into the ordering the materials (especially the pool cover) and transport to the work site. At all times you and your workers behaved in a professional and friendly manner. There were no smoking, and no empty coffee cups and pop cans were discarded in and around the house, a behaviour that was typical of previous hired workers. The finished project commands an amazing transformation of your ideas and experience into our dream-come-true reality. And visitors to our home cannot escape the wow expression. We are very pleased with the outcome and the relative cost. I have attached a couple of photos for your interest. Thank you, Bryan, for a job well done. Bravo! First of all, a big thank you for all your help in making Williams wish come true. 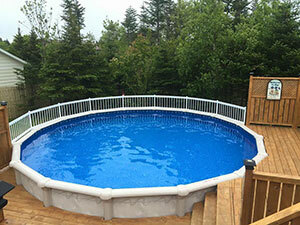 The pool is installed and the deck is about 90% complete. We really appreciate everyone's hard work. Pool heat pump is set at 82 degrees. If everything goes as planned, the "POOL PARTY" should be Saturday afternoon. Mark your calendar! Looking forward to seeing everyone who helped make William's WISH come true. Thanks again for making Williams Wish come true! Have had our pool from Clearwater Pools since the summer of 2012. Customer Service is next to none. They do our set up in the spring, maintenance all summer and the close up in the early fall. Always there at a moments notice when needed, even for the smallest of things. Great family business and a great business to deal with in general. Love Clearwater Pools! Clearwater pools are always there for us when we need them. Whether its shutting down the pools in the fall, opening in the spring, or getting us parts or chemicals when we really need them they are most helpful, quick, and courteous. Shane Gardiner - Splash N Putt Resort. I have no problem giving you guys a good review. My dad started dealing with you many years ago and we have continued ever since. Dad died 35 years ago so it must be 40 years or more since we have been dealing there. You are my GO-TO Guys for any pool related issues or items.